Most financial advice is written for people who already have money. Not the wealthy, but people who actually have disposable incomes. With a few adjustments, they can follow sage financial advice like saving a certain percentage of their income each month, or cutting extraneous expenses to save money. 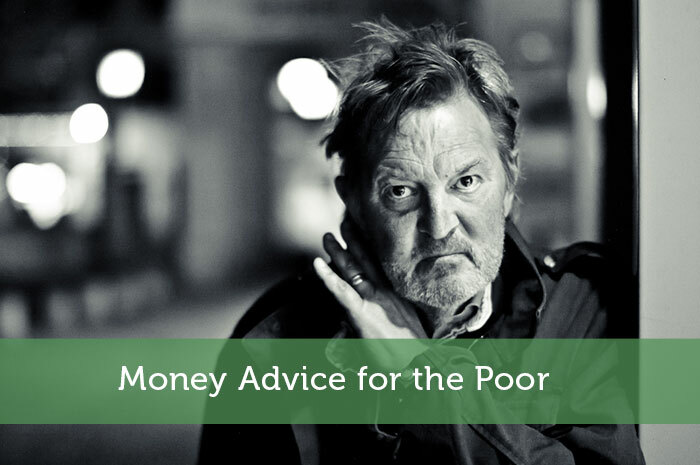 But if you’re poor — actual, hovering around the poverty line, poor – most financial advice doesn’t apply. Because once you (barely) take care of the necessities, you usually have nothing left until the next paycheck – and that check’s already spoken for. However, just because you’re dead broke, that doesn’t mean that there aren’t little things you can do to help improve your situation. Once your situation improves, you can then go to financial advice sites like CNNMoney or Banking Sense to get even more information. Chances are, you are hyper aware of where your money goes each month. Even if some of your expenses are subsidized, you know exactly how much you have to spend on rent, utilities, and other necessities. The thing is, no matter how tight your budget, there’s always hidden spending. For example, if you don’t have a bank account you have to pay fees to cash your paycheck. You may also have to pay fees to pay your utilities at a pay station rather than send in a check. And then there’s the fact that you have all this cash in your pocket. Cash is notoriously difficult to track because, unless you get and keep receipts every time you spend, you have no paper trail. Even if you think you know where every cent goes, you should keep track of all of your spending. This means getting receipts every time you make a purchase, and writing everything down. A cheap binder with loose leaf paper or a notebook from the dollar store works fine. Tracking can show you potential leak, and help you spend more efficiently. You might even find little things that you can cut to save money. Not having a checking account can end up costing you a lot of money. If you have to pay fees to cash your paycheck, you could end up paying thousands of dollars. That’s money you could have spent on food, shelter, or even savings. More importantly, that’s money that you earned. Having a bank account won’t just save you money on fees; it can also make it easier to track your spending. Companies like Bluebird, Simple and Green Dot all offer online banking alternatives, with debit cards, direct deposit, and online bill pay, and many have no fees. You can access your account anywhere that has internet access, including the computers at the public library – just make sure you completely log out and don’t have the computer save your password. Many services will allow you to deposit checks through a mobile app, or at physical locations like Walmart or Walgreens. There are plenty of resources warning you not to use businesses that take advantage of the poor. Those resources are aright, albeit unrealistic. Spending upwards of $20 a week to rent a new washer. Sure you could save up and eventually buy one, but that’s not always realistic. You know how it is, set aside $20 today, and tomorrow you’ll have a $20 emergency. Meanwhile, you’re spending another $20 on the Laundromat each week. If spend that initial $20 to rent a washing machine, you might still have that $20 emergency, but you’ll also have a washing machine. Avoiding money traps that exploit the poor is easy, when you’re not poor. When you are poor, it’s better to choose your devil wisely. Remember to keep track of your expenditures. Find out what you’re spending on and learn ways to minimize these expenses. Avoid incurring debt as much as possible. It might set you back a few years from reaching financial stability. The road to becoming financially capable might be hard, however, if you persevere, you can definitely reach it. The stats on “poor” people without basic bank accounts is pretty crazy. I can’t imagine paying a fee for every check I cash. I used to hand wash clothes in the sink while I was at uni. I could only afford to rent a room and had no fridge, washing machine, oven, etc. I bought and adjusted cheap clothes from charity shops (which I still use now, even though I’m out of debt and working) so the material didn’t require any special treatment. This is valuable info since not everyone can take some of the PF advice out here in the blogosphere. I’m working for myself now so my husband and I have to be much more conservative in our overall budget and financial plan. It’s important to offer some concrete options for those who are struggling financially and scale down suggestions to where they are at currently. Speaking of washing machine, I’m afraid ours got a slight problem. Because I’m still using a manual one, you need to hold the timer in order for it to work. I already called my friend who knows how to fix appliances. I’ve been here. I try to write to this demographic often because the advice is usually 100% different when you’re trying to get up to the level where you can use most of what floats arounds in the PF blogosphere. When getting a checking account, make sure there are no fees for monthly average balances or if you don’t have direct deposit (or your direct deposit doesn’t meet a minimum threshold.) The 5 major deposit banks in the US now have these (no such thing as truly free checking among them,) and when you’re not making a lot, those fees can add up just as easily as cashing your check. Smaller banks or credit unions may be your friend in this respect. As far as the washing machine thing, I’d look for one in classifieds, online or otherwise. A lot of times when people move they’ll sell them dirt cheap. I know it’s just an example of a much larger issue, though. I knew plenty of people who paid to have their paychecks cashed at Walmart or other locations. I just couldn’t believe that they would give away their money like that when a bank will do it for free. Sorry this is so late – to answer the question of the poor paying to cash their checks – it is usually because they still owe another bank some money (overdraft or whatever), and therefore another bank won’t open an account for them. Plus, checks have to have time to clear -once you get it to the bank – before funds are available. I am an avid believer that tracking your spending is important, However I would like to take your step a little bit further by saying that budgeting and building a financial plan that will get you kick started into the the path of becoming affluent. Or well not even affluent, but becoming debt free, wealthy, or simply being able to have an emergency fund. I think tracking of spending is the most important, if you do not know where your money gone to, there is no way of reducing your spending. I am actually blown away at how many people don’t have a bank account. I thought that opening one when you got your first job was a logical step in the process. But for some reason, it isn’t. The best money advice for the poor is to find a way to increase their income. People in that kind of financial hardship can cut costs only so far…..the only thing that is going to put them into a better situation is to find a way to increase their cash flow! Effective article, I believe its right of people irrespective of how rich or poor he may be, to do something or the other to run their livelihood. For which every possible effort should be given to make it useful in later part of life.